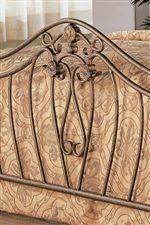 This beautiful iron bed will make a stunning centerpiece in your transitional style master bedroom. 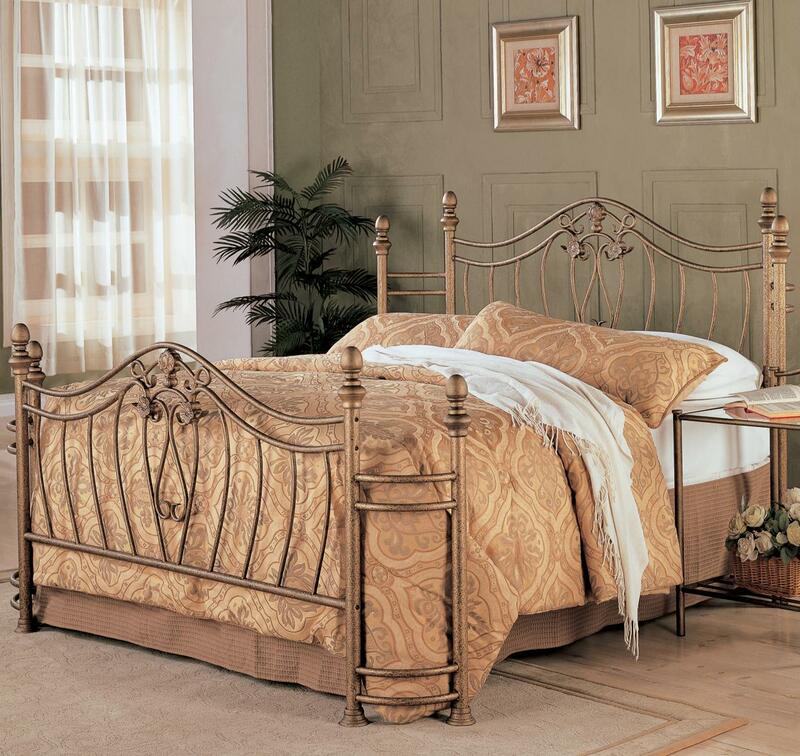 The bed has a high curved headboard and footboard with elegant curved crowns, and swirling floral motifs. The wraparound design has a timeless classic look, and a comfortable feel. Simple smooth oval finials and trumpet feet complete the piece, creating an understated style. In a warm Antique Brushed Gold, this bed will blend nicely with different styles of decor, from more traditional to casual, making this a great choice for your home. Pair with the matching nightstand for a complete ensemble. This piece also includes a metal frame. The Sydney Queen Iron Bed by Coaster at Value City Furniture in the New Jersey, NJ, Staten Island, Hoboken area. Product availability may vary. Contact us for the most current availability on this product. 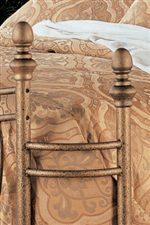 300171Q Queen Iron Bed 1 77" 90" 52.5"
Finish & Paint Options Antique Brushed Gold metal finish. Case Detail Elegant curves, round legs. Drawer / Shelf Construction Slatted metal shelf. Description: Top Sophisticated glass table top. The Sydney collection is a great option if you are looking for Casual furniture in the New Jersey, NJ, Staten Island, Hoboken area.